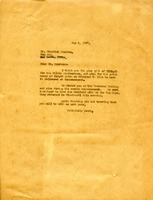 In this letter Bishop Frederick Reece donates ten dollars to The Berry Schools for the Silver Anniversary. Mr. William A. Parker donates $10 to the Berry Schools for its Silver Anniversary. 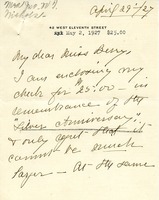 Miss Berry hopes this Silver Anniversary will be her greatest as she does not look to be here for her Golden. Adelbert Moot congratulates Martha Berry on her Silver Anniversary and donates $25. Moot expresses the wish that The Berry Schools reach a golden anniversary as well. 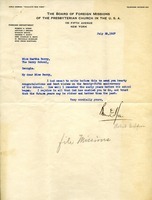 Mary B. Nichols sends a check of $25 in remembrance of the Silver Anniversary. She also thanks Miss Berry for the cotton balls she received. 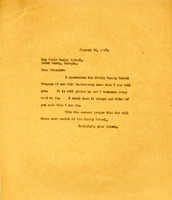 Martha Berry sends Miss Neal an invitation to Berry Schools' 25th anniversary. A notice of the Silver Anniversary Year of the Berry Schools in which donations towards the celebration are being requested. 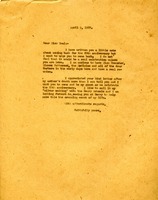 A $2 donation from Dr. Howard G. Myers is recorded. 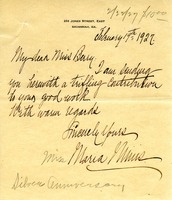 Martha Berry sends Mrs. Morris a letter to inform her how important donations are to Berry. Martha writes to Standish to thank him for his gift for the Silver Anniversary and to say that he was missed at the Trustees Meeting. 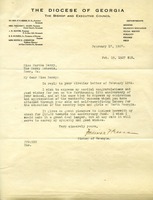 Letter from The Board of Foreign Missions of the Presbyterian Church in the U.S.A, with hearty congratulations on Berry's 25th anniversary. commissions, Missions, Silver Anniversary, The Board of Foreign Missions of the Presbyterian Church in the U.S.A.
Berry sends thanks for the Sunday School program for the 25th Anniversary. 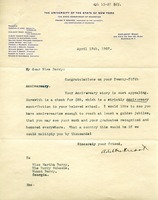 Martha writes to Mr. Macy with the plans for the Dairy House at Berry and discusses the 25th Anniversary at Berry.